We were introducing Rogue Trucks, an innovative design which featured an insert bushing in the hangar that controlled lateral hangar motion without restricting turn depth, and needed a simple image to show what the insert bushing does and how all the parts fit together. I photographed the truck assembled and disassembled, then laid out the ad and wrote the copy, which appeared in the Concrete Wave magazine Buyer's Guide. I created and later revised the Skate House Media TV logo, which became an integral part of the site's identity when Matt Kienzle, one of our best video editors, animated the logo and used it to place humorous clips at the intro and outro of every video. In 2011, I created location-specific Skate House stickers for distribution at skate events in Canada, Colorado, and New Mexico. Sticker Design - Skate House Media "Skate and Don't Die"
To promote responsible skating on open roads, I adapted the iconic "Skate and Destroy" script to read "Skate and Don't Die." 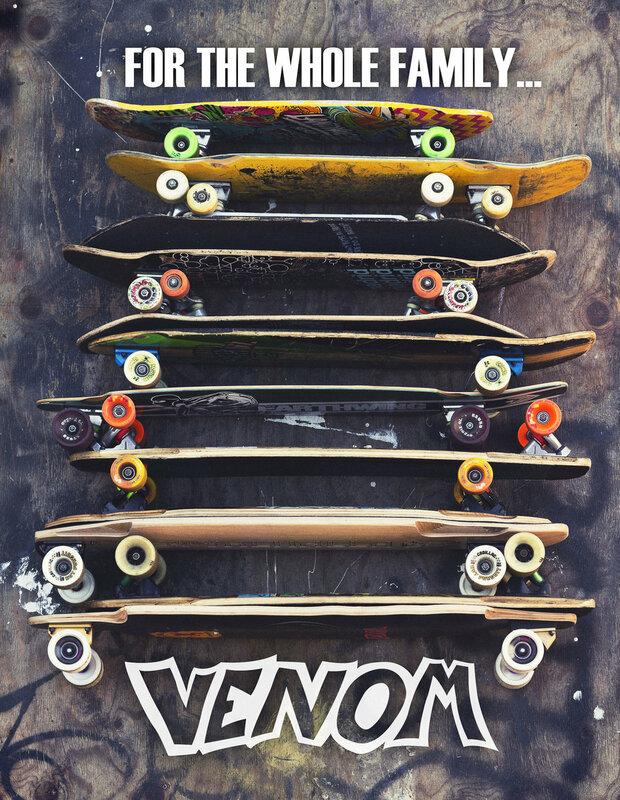 This slogan was printed on stickers and distributed at downhill skateboard events in the United States, Canada, and Europe. This sticker campaign is tied into my extensive writing about downhill skateboard safety. With the overwhelming majority of skateboarding deaths resulting from downhill head injuries and/or being hit by a car, skateboard safety is especially relevant to longboarding, which is almost exclusively practiced on open roads. I have tried hard to use my experience and credibility in skateboarding to encourage conservative, risk-aware skateboarding. Direct cash sponsorship of downhill skateboard events is expensive and creates minimal value because there are few spectators and participant skateboarders pay little attention to course-side banners or tiny logos on typically-ugly participant t-shirts. In lieu of offering direct cash sponsorship to events, I designed attractive event-specific t-shirts with prominent Madrid Skateboards logos (on the back, above the hem where they would be visible in follow-car video) that we gave out for free, creating superior marketing value at lower cost. Region-specific promotional stickers for Brazil, Canada, Colorado, and Germany. Distributed in limited numbers in 2015, these were prized by locals and can still be seen adorning prime real estate on skaters' helmets, boards, and cars. Having long entertained humorous inquiries about whether we had plans to expand our business into polyurethane adult toys, I used the introduction of our new wider, stepped bushing to construct a Venom adult toy and styled it to look as though it had been found hidden in a teenager's mom's dresser. 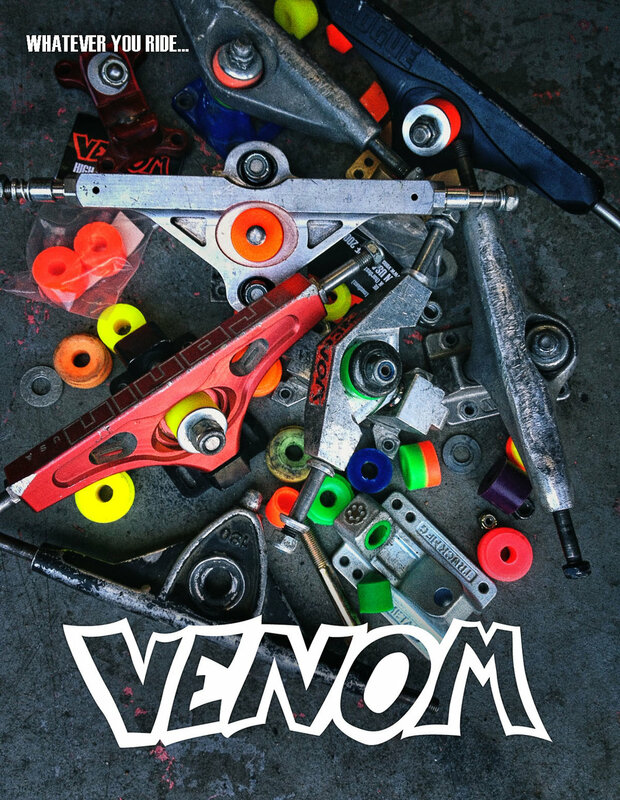 Venom was introducing a new high-performance core for their racing wheels. I photographed two wheel halves to illustrate the difference between old and new products, added custom script detailing the specifications, and laid out the type.